PREVIOUSLY USED BUT FULLY WORKING. Ukraine: Coverage for most urban areas. Republic of Macedonia (FYROM): Full coverage. Montenegro: Coverage for most urban areas. Serbia & Kosovo: Full Coverage. Bosnia & Herzegovina: Coverage for most urban areas. Garmin Nuvi 67 GPS Navigator. Garmin Street Pilot C580 GPS Navigation System Receiver Tested 3.5"
T he battery has not been tested. T he unit has been tested and is fully functional. The unit housing does have very minor scuffs and nicks as does the screen. TomTom Window Suction Mount. An included windshield suction mount holds it in place. Other display features include a compass mode to assist you with directional orientation, and an anti-glare screen for optimal viewing even in direct sunlight. Garmin GPSMAP 296 Bundle with Mounts Aviation, Terrain & Obstacle new battery! Garmin GPSMAP 296 Bundle with Yoke and Dash Mount Aviation, Terrain & Obstacle. Just purchased a brand new battery for it. Tested and working, comes in the pictured condition with everything pictured. Please note that the yoke mount is missing a piece. EXplorist XL Key Features New Magellan Geocaching File Manager software. IPX-7 Waterproof and Rubber Armored. Unit size 6.4"H x 2.9"W x 1.33"D. 14 Parallel Channels with WAAS enabled. They work very hard to get quality products to you quickly. Garmin StreetPilot c330 Car Auto GPS Navigation w/ Mount Complete in Box Bundle. Condition is Used. Shipped with USPS Priority Mail. 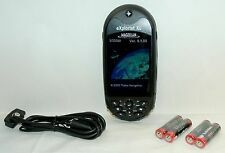 Magellan Maestro 3250 Car Portable GPS Unit System Set 3.5" Excellent Condition! Model Maestro 3250. System Type Handheld, Portable, Fixed. This is used but in excellent condition. Still has the screen protector in place. Display Type 64k Colors Display. Screen Size 3.5". Map Capabilities Internal. These units need to be updated ( we don't know if the updates are free for these units), to do so you need to go to Magellan's website. We do not know the full history of each item. This is a used item and will have signs of use. The unit weighs under 2 lbs. OEM window mount, adjustable. 3.5" LCD Screen. Bird's-eye 3D view : Clearly see your surroundings in 2D or 3D. SiRFstarIII?. QuickSpell?. Auto night view : Adjusts color and contrast for easy night viewing. They work very hard to get quality products to you quickly. This is used but in working condition. Minor scratches on the device. With a single touch, find your favorite café or restaurant when you're traveling within any city. When you're traveling down the Interstate and need to find gas, food, or lodging in a hurry, touch the highway exit POI icon to see which upcoming highway exits have the services you need. The Crossover gives you the tools you need to make sure your next car trip is as enjoyable and hassle-free as possible. (Note: subscription required for traffic reports). Its sleek and rugged design makes the Crossover easy to take with you wherever you go. Tested and working 100%. Unit may be dark grey, light grey or black in color. [Mio25B-1] For sale is a Mio DigiWalker C220 unit that features a 3.5" Color LCD touchscreen! Mio DigiWalker C220 unit. Both affordable and stylish, the Mio C220 makes it easier than ever to get where you are going, even when you aren't quite sure where that might be. Bluetooth wireless technology, built-in microphone, and speaker for hands-free calls with compatible phones. Model: nüvi 360. MP3 player with pre-loaded sample songs and audio books, JPEG picture viewer, travel alarm, and currency converters. UNIT ONLY! NO CORDS, CABLES, OR MOUNTS INCLUDED! Sony Quick Start Guide. This is a used item in excellent condition with minimal markings from prior use -- the screen is clear with no scratches. Model was tested and it functions as expected. Car battery adapter. Unit is preloaded with Worldwide Basemap showing countries and borders. The battery box is clean as seen in picture. Why settle for less. Excellent Geocache machine! I have verified Unit in complete working condition. Mio DigiWalker C220 Automotive Mountable. Shipped with USPS Priority Mail. New unit in open box. Garmin Nuvi 350 NA 3.5" GPS Navigation System Silver GREAT CONDITION! Excellent mint condition and you will receive everything pictured. Turn it on and Go! Talk about worry-free driving. Now there’s no more fumbling with your phone’s handset to answer a call or dial a number — just tap the c550’s screen and you’re connected. Steer clear of traffic with the c550’s integrated traffic receiver.